World War II: A History in Documents illustrates the major themes and issues of the Second World War, including its causes, course, and consequences. Paying attention to both the European and Pacific Theaters--as well as to homefront and battle front issues--author James H. Madison blends discussions of diplomacy and strategy with insights into the lives of ordinary people around the world, including factory workers, soldiers, mothers, propagandists, political leaders, and survivors. Set in thoughtful contexts, these powerful and telling documents encourage students to compare different nations and cultures at war and to think critically about twentieth century history. The documents include such diverse items as American political cartoons, combat memoirs of American GIs, a call for Canadian women war workers, popular American songs, an interview with a Tuskegee Airman, Eisenhower's D-Day message, Russian propaganda posters, the diary of a German teenager, a memoir of Japanese-American internment, a painting of an Australian bomber crew, newspaperman Ernie Pyle's reports to the home front, the last letter from a Japanese kamikaze pilot, and testimonies of Holocaust survivors. Both broadly authoritative and full of intriguing, unexpected particular facts.The author conveys the heroism of The Coast Guard fully intact throughout.A smashing performance! 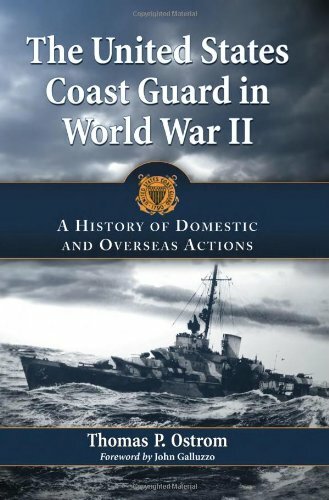 What I liked most about this book is its ability to go from general characteristics of wartime Coast Guard service to specific missions such as Operation Hula and The Aluetian Campaign. Ostrom conveys senses of action, deliberation and heroism. He doesn't have a slow moment in the entire book.The narrative style provides a current that flows the reader from page to page.Highly recommended to any and all World War Two afficianadoes. Ostrom creates a narrative that conveys the atmosphere of a peacetime service with a wartime mission.Well illustrated. Well researched.Both general doctrines and accounts of specific missions are well integrated. 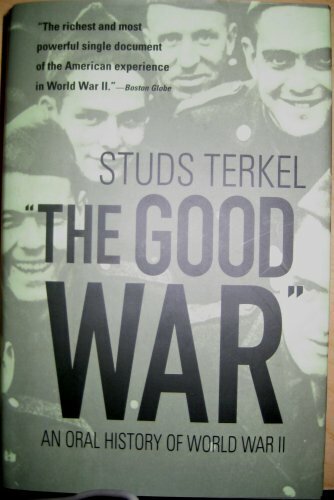 An excellent book that covers the war from 1939-to 1945. Covers the European Theater and the Pacific theater. 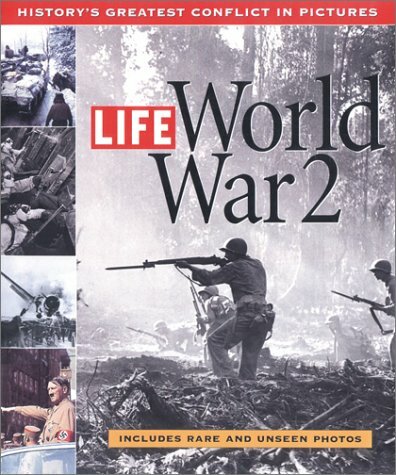 Prior to reading this book i lacked the facts of WW2 and this book really helped me understand everything from A-Z. I defiantly recommend it ! This was a great purchase from a great seller. Great reliable service and safe packaging. Thank you. I bought this book despite my concern that it would sacrifice breadth for brevity.So I was pleasantly surprised to find that it's actually quite comprehensive, if not super deep in its exploration of every aspect of the war (how could it be, in 375 pages of readable type? ).What's more, the author's political insights generally ring as true as his military history is impeccable. A Short History of World War II is also very well-written and -edited, with little to no awkward grammar or silly diction, and superb organization and flow.As well, the maps are hugely helpful--although I will say that the last two fail to point out a few pertinent locations, and could stand to be better oriented on the page (i.e., with north pointing toward the top of the page, instead of to a corner). 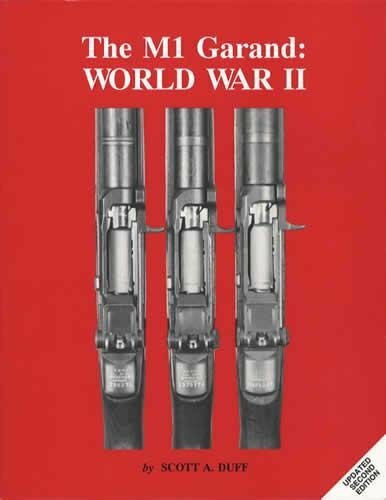 All in all, if you're looking for a snappy yet excellent introduction to or overview of the Second World War, I can't imagine that you can do much better than this volume.The basics are all there, and in readily digestible and even incisive form. If you want a place to start, you can't go wrong with this book. It starts with the end of WW1 and ends by hinting at some of WW2's long term consequences (cold war, Vietnam war,etc). Not every battle can be covered in a book this size, but it does discuss the major ones and their implications on a broader scale. But this is not your dry academic history textbook. The battle descriptions are vivid and even exciting, at times. It is clearly written and easy to read, almost conversational. I not only came away with a much deeper understanding of this pivotal event in history, but it was also an enjoyable read. It seemed fair and balanced to me but I'm no history scholar. The only problem was that there should have been higher quality maps and more of them. The few maps in the book are simple black and white line maps with no hint of shading or features. Perhaps a new edition will address this shortcoming. Because of this, I was thinking more like 4.5 stars but I rounded up. Despite this, I would highly recommend this book to anyone wanting an excellent overview of WW2. I would definitely get this over the WW2 for Dummies (which I also read). I have not read the Keegan book but plan to. I must admit to being amazed when I read this book.I must also admit to being wrong.When I was first given a copy, I took one look at it, saw the size of the book (about 400 pages) and said, "yeah, right, a short history of World War II all in one relatively small volume...what a waste of time this one will be. "Good grief, I was wrong.If an individual is looking for a very concise and readable overview of this world changing event, that is extremely readable, well researched and hold the readers interest from cover to cover, then this is the one to buy.Now granted, there is no way to compact the information of thousands of volumes of information in to a mere 400 pages, but the author has certainly made a good stab at it and it is astounding the amount of information he was able to pack into this one. The author has treated all sides of this war with a pretty equal hand, more or less calling it as most reliable historical documents indicate.I do note that at least one reviewer did not appreciate the way the author treated French involvement.About the only thing you can say to this is "hey, read your history. "The author certainly did not make this stuff up as there is ample evidence at this time of pretty well who did what to whom at the time. Like another reviewer, the only objection I had to the entire book was the lack of maps.This work could have been greatly enhanced by a nice set of maps.Now this is a pet peeve of mine and may not bother others as it did me.The author does have a wonderful writing style with syntax that is easy on the eye and quite simple to follow. This is a very nice, one volume survey type study that is quite readable and quite informative.Even for the individual who knows absolutely nothing of this event, it should stimulatethat reader to find more, other volumes to follow up with and goodness knows there are plenty of them out there.Buying them has kept me on the verge of complete poverty for the past 40 or so years.Recommend this one highly. This dense and fast-paced "history in pictures" flows chronologically, beginning with the prelude to the war, and ending with the conflict’s aftermath. Classic images from the LIFE archives, such as the moments just before and after that unforgettable kiss captured by Eisenstaedt in Times Square, as well as rare government photos recently released from other countries, such as chilling color photographs of Hitler taken by his personal photographer, make this volume a picture history, of unparalleled depth and power. In Lenigrad under siege, a couple pulls a sled bearing a tiny coffin. In Coventry, a priest leads his congregation in prayer, surrounded by the ruins of their cathedral. In the field, a bleeding German soldier is comforted by his comrades, his right arm lying in the foreground. In Kent, schoolchildren watch a dogfight with expressions ranging from horror to delight. In Rotterdam, the city is leveled as far as the eye can see, except for a lone church. In an internment camp in Wyoming, two Japanese-American soldiers, visiting their families, stand honor guard beside the casket of a Japanese-American World War I veteran. Every picture in this remarkable book reminds us that the story of World War II is much more than a collection of battles and troop movements; each reminds us that the war produced a multitude of heartbreaking stories played out all over the world. The book surveys the entire war, year by year. Each year is introduced with an essay by a well-known person (e.g., John Keegan introduces 1944) and includes photo-biographies of distinguished and infamous people, such as FDR and Churchill, Hitler and Mussolini. This collection of outstanding photographs is as moving as it is comprehensive. If you have a deep interest in World War II; if you are looking for an easy-to-digest survey of the entire war; if you enjoy photography as an art form; or if you are moved by depictions of the human condition, to you I recommend this book. 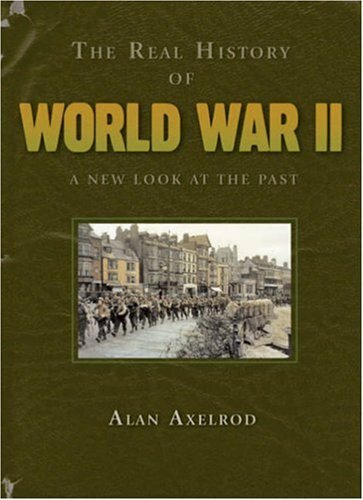 In a refreshingly fearless, colloquial voice, acclaimed historian Alan Axelrod recounts the key events of World War II with unflagging humanity, drama, and straightforward explanations of their significance, weaving a story as engrossing and multifaceted as a great novel. 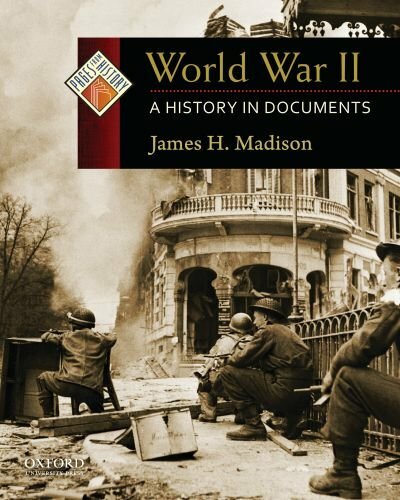 As with the series’ first entry, The Real History of World War II remains authoritative, non-academic, and appealingly designed with illustrations, maps, and more. It’s a unique approach that makes this enormous saga understandable to every reader, and favors gripping storytelling over a strictly dry and plodding chronological account. Axelrod brings you right into every theater of the war, one by one, capturing all its most compelling events before moving on to the next. If, today, we see World War II as a titanic clash of good and evil, Axelrod effortlessly looks beyond this schism, putting facts above political interpretation in order to uncover the conflict’s roots and ramifications. He concisely explores the war’s ideological, nationalistic, and economic causes; probes the motivation of those involved, including Hitler, Mussolini, Stalin, Churchill, FDR, and Truman; and looks at its enduring political, global, social, and technological legacy. You’ll be able to understand the tragic legacy of Versailles, the full repercussions of the blitzkrieg, exactly what happened in the Holocaust, and why, in Japan, the war was less associated with one individual than with an ongoing militaristic and imperialist movement. In addition, this enlightening volume provides a concise narrative of the entire course of the struggle, which unfolded simultaneously in many places, thoroughly engulfing the world. The fresh insights and forthright analyses, the sidebars on such subjects as trivia and alternative histories, the eyewitness testimony and quotes, and the revealing, edgy attitude make this a pleasure to read like having an enjoyable conversation with a favorite teacher. History truly comes alive. 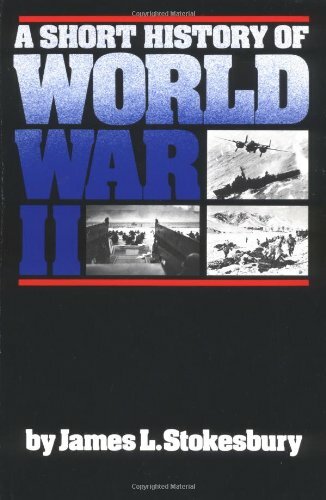 A great read with excellent visuals and sidenotes to really pull in the reader.This book is great, it gives an excellent overview of every aspect and major battle in the war.I also enjoyed it because it gives you a nice flavor of World War I and how is attributed to World War II.Can't recommend it enough. Axelrod's book on World War II is more a social and political than a military history. He gives abundant background--from World War I on up.He also analyzes, briefly but deftly, the social, political, and economic trends that provided the seed-bed for the war. His work is encyclopedic, jumping from Europe to the Pacific to Africa to South Asia; but he manages to fit all the pieces together into a coherent whole. Mercifully, he does not get bogged down in details of battle, but concentrates on strategy and overall goals. It is replete with sidebars that clarify and summarize and give notes on interesting details. His scope is panoramic, and he puts the war, its leadup and aftermath, in a broad context. He is trenchant about the interaction of personalities and social trends. Best of all, Axelrod is a wonderful writer.Pithy, concise, elegant, probing, his prose is alway flexible and revealing. The one criticism I have--and it is a small one--is that the maps have been shrunk to microscopic size. But given his overall descriptive powers, this hardly matters. P.S. Among his several "What Ifs" Axelrod poses this.Rather than speculating if WWII might have been averted if the Versailles Treaty had not been so harsh, he says (far more plausibly) WWII might have been averted if the U.S. had not entered WWI--leaving it a stalemate, from which a less lopsided peace might have emerged.A cogent point. This is a great overview of World War II without an overabundance of detail.A real history buff would probably like to read a more wordy account, but, for readers like me, this is enough.I was a little disappointed that more information wasn't given about the Japanese-American internment camps in the US.This is a subject that I didn't anything about until maybe 10 years ago. History records few more gripping dramas than the naval history of World War II. It was the last great sea war, but in the half century since the final battles of that struggle, the conflict has receded into the past. Narvik, the Battle of the Atlantic, Midway, and the Philippine Sea are to the current generation as remote as Waterloo and Gettysburg. In War at Sea, Nathan Miller brings the story of these monumental events--and the achievements, suffering, and heroism of those who served at sea during World War II--to the attention of readers who have only a nodding acquaintance with it. In doing so, he illuminates in dramatic fashion the costly mistakes and the blunders, the great skill and courage of the Allied commanders, tactical leaders, and enlisted men that denied the Axis powers victory. From the sinking of the British passenger liner Athenia on September 3, 1939, by a German U-boat (against orders), to the Japanese surrender on board the Missouri, on September 2, 1945, War at Sea covers every major naval battle of World War II in one fascinating volume. In gripping detail, Miller recounts the major operations of the British, German, American, Japanese, Italian, Canadian, and Russian navies. Based on recently released Ultra intelligence information the Allies procured from their deciphering of coded messages passed by their enemies, ship logs, official reports, interviews with surviving servicemen, and personal accounts and anecdotes from the men who manned the ships and the aircraft, Miller gives a human face to the daily routine of life at sea--from being torpedoed to living in the confines of a submarine for weeks at a time. Miller also details the political and historical backgrounds of each navy and analyzes the strategies of the combatants. He goes on to show how new technology, such as aircraft carriers and submarines, pushed aside the battleship and changed the course of the war and modern warfare. War at Sea covers every major naval battle of WW2. This book is a comprehensive history for the general reader. Miller gives equal weight to all of the major participants:the Americans, British, Germans, and the Japanese. The author also presents the background necessary in order to analyze the strategies of the combatants. This book is a complete one-volume history of the war at sea and the general historian should find this book a good read. The book arrived in very good condition and I am currently involved in reading it. The text is great and I am thoroughly enjoying it. It's an engrossing book at an incredible price. 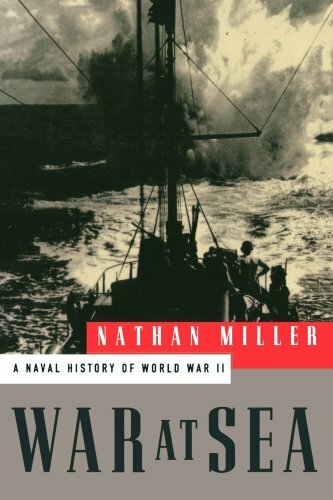 Solid, general history of the naval war of WWII.Would have liked for the maps to be included in the chapters instead of all grouped at the end.Also, Miller focuses heavily on air power and omits the contributions of the U.S. Submarine force in the pacific theater.The book is slightly to narrative for my tastes and only vaguely touches on the production of naval equipment or the rapid changes in technology and subsequent strategic and tactical changes.For the causal reader. This work is pure and unadulterated magic for any reader even remotely interested in World War II.The scope of the work is daunting:documenting the enormous impact naval activity had on the course of the War . . . in one manageable volume. As a fairly well-read amateur historian (admittedly unfamiliar with many of the primary and secondary historical sources upon which the author relies), I cannot overemphasize the joy I found reading this book.The author's prose is almost uniformly flawless, a characteristic sadly lacking in all too many historical works.The book reads as easily as any work of fiction you would care to name, without losing any of itshistorical accuracy or objectivity. The author scrupulously documents the issues faced by all the War's participants, though a careful reader might detect a certain amount of Anglo-Allied bias.However, whenever the author passes judgment on the actions of a particular admiral or political leader, he almost always presents an opposing viewpoint. Overall, the reader will be, as the title of this review indicates, in the presence of greatness upon taking up this book. For courses on World War II, Military History, and 20th Century Europe. 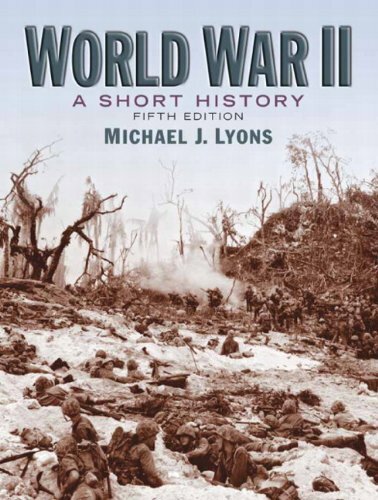 Highly regarded for its concise clarification of the complexities of World War II, this book illuminates the origins, course, and long-range effects of the war. It provides a balanced account that analyzes both the European and Pacific theaters of operations and the connections between them. The Fifth Edition incorporates new material based on the latest scholarship, offering updated conclusions on key topics and expanded coverage throughout. I received the book in impeccable timing, and I peronsally think that the book is in better condition than advertised. Thank you so much! If you like text, this book is for you.It flows well, is balanced and fairly easy to read, but if you like color, don't bother.It is black and white throughout.More maps would be helpful, as would graphical comparisons when listing out numbers and totals. In depth text of the events prior, during and after World War II.Starts with the Signing of the Treaty of Versailles by the "Big Three" (France, Britain and United States) and ends with the events leading to the unset of the Korean War.In the text there are numerous maps of military strategies and movements from the Mediterranean Theater Operations to Germans' Blitzkrieg.I personal recommend this prestigious text for anyone wanting an extensive academia perspective to the events, people, and situations of World War II. The book definitely offers a good overview of the EUROPEAN part of World War II, from diplomatic, economic, military before and during the conflict. Lyons offers a balanced view of conflict and that would both be suitable for academics and general readers alike. Lyons' style also provide the wealth of information in an interesting way. To assemble the text for FORGOTTEN VOICES OF WORLD WAR II, Max Arthur and his team of researchers were given unlimited access to the complete collection of World War II audiotapes accumulated by the British Imperial War Museum. These are the almost-forgotten voices of an entire generation of civilian and military survivors of some of the most mundane (or horrendous) episodes of the war. Their simple, often rough, words cut straight to the heart. "I tried to sit on my raft, but every time I pulled it down, the other side came up, and so I packed it in, because it was falling on my face all the time. We were on three separate little rafts . . . I actually tried to go to sleep on this thing that was tossing up and down. I thought, if I'm going to die, I might as well die in my sleep. And then Dundas shouted, 'What's that?' and I woke up a bit and looked behind me, and there was this destroyer coming, the Electra. What a beautiful sight. "Then it went straight past us." Tilburn, Dundas, and Briggs were the only survivors of the sinking of the HMS Hood by the Bismarck; 1,415 of their comrades went down. Tilburn's narrative, and those of thousands of others--Americans, Australians, British, Canadians, French, Germans, Japanese, Okinawans, Russians, and more-give us an unvarnished picture of the true cost of war for its survivors, as well as an incomparable tribute to the many who did not make it. There is always so much imfo. in these war books that whenever one reads them it's impossible to take it all in. I read the first Forgotten Voices book (WW1) and most of it was about the Trench Experience. WW2 however was just so huge that you feel the author struggles admirably to get it all in and at the same time maintain the entertainment factor of the first book.Practically everything in the book is an account of something told by a survivor. Max Arthur obviously has to try and use accounts which are funny perhaps, or sad, or imformative or all three. The book just can't go into depth about certain things. There is a D-Day section, a concentration camp section, Market garden, Africa, Japanese etc. and there are books out there about these things in their own right. For instance I just read Armageddon by Max Hastings which is about the battle for Germany in '44/'45. 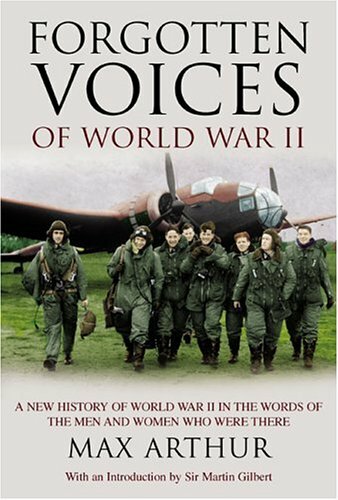 But this book, Forgotten Voices, is not really about the war. It is about the ordinary people/children and soldiers fighting/existing in it so there's a big difference between this and all the others. On several occasions while reading it I've had to put the book down when reading of a situation someone had found themselves in- I've just put the book down and thought 'Oh my God!' and have needed time to think about it before continueing. It is a mainly British perspective with the occasional American/German/Dutch input etc. I would strongly recommend it and if you like these Forgotten Voices books then you would also like All Quiet on the Home Front. A similarly told book of mainland Britain during the first world war. There are any number of books written by people involved in World War II, most of them of course by Generals. This book is different. Like Steven Ambrose's collection of recordings from vetrans in this country, the Imperial War Museum has taped the accounts of thousands of ordinary participants from World War II. Here is the report from the young British sailor. He got a pass and with his friend picked up two girls to go to the movies. Suddenly the movie was interupted with a message for all sailors to return to their ships. They went to Dunkirk. Some of the recordings are from the Axis. A Japanese naval officer reports: "Our forces were ambushed by the American forces... My ship was hit by more than a hundred shells in, I think, about a two hour engagement. At that time I was quite high on the deck, and I was holding the binoculars with both hands. A splinter came up and cut off both my arms in the middle. 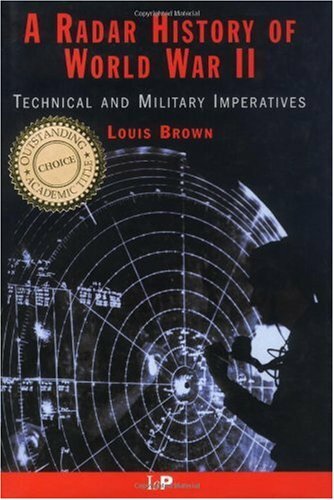 I just finished reading "A Radar History of World War II: Technical and Military Imperatives" by Louis Brown. It was an enormous tomb over 500 pages, packed with details about many battles in the Pacific and Europe, including commanders, ships and, of course, exact details of radar equipment. But between the dry details there were fascinating glimpses into how radar was invented, developed, deployed and when, and when it did not, play a decisive role. It also covered the various purposes such as detection of incoming aircraft, fire control, friend/foe determination, mapping, navigation and even communication. There was also an appendix with quite thorough discussion of the principles just how radar works, much more than just "send a beep and listen for the return". I came away with two overall impressions. One has nothing to do with radar: WWII was a very big deal that pretty much consumed the planet's attention for half a decade. I knew this, of course, but the relentless detail made it come alive and drove the point home even more so. The other was the speed at which the radio art in general, and radar in particular, was developed in support of the war effort. This was true on all sides, not just the US and Britain -- several countries made various advances all stunning in their own rite. In just a few years we went from relatively crude radios to highly sophisticated microwave systems that established principles still in use today. It made me wonder if there are ways other than the threat of death to produce this level of invention? And what wonders could be achieved if this intensity could be sustained indefinitely? Well, it was a heavy read, but when I finished I laid it down and just sat on the couch feeling both amazed and disgusted at what humans are capable of. Great technical and historical insight. This book takes the reader through the technological development and military use of Radar in World War II. This is an exhaustive but very readable account.The author manages to keep the technical details to a minimum but allows a deeper insight in to several major WWII battles and campaigns.There are descriptions of lesser known radar systems and uses that are quite illuminating when put in context with already known history especially in the Mediterranean and Pacific theatres. If the reader does not have a background in radio/radar theory there is a section that runs through the basics needed to understand this.That being said I found myself frequently turning to a 25 year old copy of "Aircraft Electricity and Electronics" to get myself up to speed.If the reader is more technically informed I imagine this would not be a necessity. Having said that this is a very informative book and well worth the time taken to absorb what it has to contribute especially to airborne and naval history of WWII.I would highly recommend this work. The book is an extremely valuable, comprehensive and trusted source of information about all principal aspects and many details of the radar before and in time of the WWII, except one minor aspect. This is the pre-war history of radar R&D in the USSR. The author cites only one reference - a book by a Soviet general M. Lobanov, who supervised the gun laying radar developments in the 1930s, written in 1975. Still it is clear that the author could not read Russian and so had the book translated by someone. It looks like not all the book was translated or read, because too many facts, names and organizations are twisted, mixed up and simply omitted. This old Sovet book gives much better vision and proper names and facts than those reproduced by L. Brown. Still today exist other sources on this topic. In some sad way, the mentioned deficiency continues long tradition in the English-centered literature of neglecting and not accurate using the information available about the radar in the USSR even if it is scarce. The tradition started when someone in America in 1944 made a capital error in the name of one of two Russians who measured a real cavity magnetron in 1937 and published it in 1940 (in Russian) -correct name Malyarov or Maliarov was twisted and printed as "Malairov". And so, forever in English/USA publications the poor guy is "Malairov". L. Brown, in similar way, twisted the history of the research radar Zenit and presented it in a most sardonic way as an example of the worst radar development existed at that moment. I am not going to discuss this in details. I'd like only to note that, first, in the mentioned boook of Gen. Lobanov the story of Zenit is given with great sympathy and his evaluation of that achievement is clearly highly positive, at least at the time of 1938-39 testing. Second, the subsequent failure of the project was not a result of bad engineering, as it is presented by L. Brown, but rather of the Orwellian circumstances of the Soviet life in the late 1930s. The story of Zenit can be read in A.A. Kostenko, et al., "Development of the first Soviet three-coordinate L-band pulsed radar in Kharkov before WWII", IEEE Antennas Propagat. Magazine, 2001, vol. 44, no. 3, pp. 28-49. I hope that this story and proper names of people and organizations, and also principal facts, will be presented in better way when, if ever, this book is published as a next edition. In A Radar History of World War II, physicist Louis Brown recounts the little-known history of a technology that may very well have been the difference between a free world and a Nazi-dominated one. 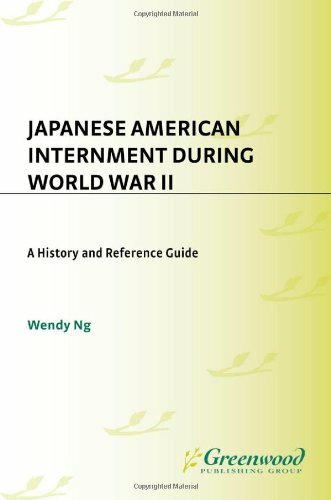 The book provides very painstaking details and is unique in that it describes the technology that existed within the societies of all major combatants: Americans, British, Germans, Russians, and Japanese. It is also agood primer on the basics of radar that can be understood by the layman. This is the best pictorial history of WWII I have ever seen. I bought this book as a gift and quickly decided it was inappropriate for the intended recipient. Pictures are very graphic and disturbing. I gave it to our high school librarian and she reviewed it and placed it in an area reserved for teachers and mature readers -- too graphic to be placed on the open shelf. It is appropriate for a mature reader/historian interested in the time period. There is a then and now section that looked interesting - how the events of WW2 influenced recent cultural events and world history. Since I Love Leaning about WWII it was a great book. 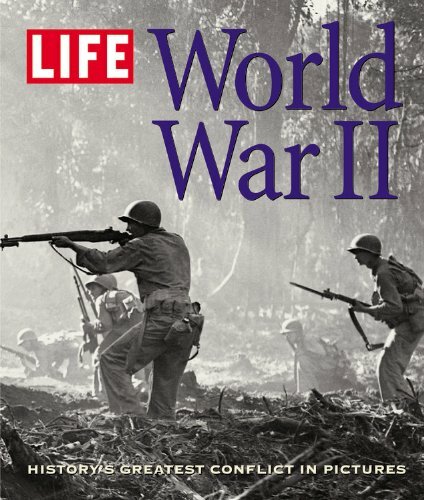 It has a lot of pictures but explains about WWII well. So if you want to learn about WWII it is a good book. If you don't just like reading books with words and don't pictures to make it more interesting then it would definatly be a good book. If for some reason you don't like books with a lot of pictures then mabye you should get a different book. In world 2 there was a war in Hawaii. (Four star book.) it is all about war and places thats on fire.And the war was long ago. And it has great pictures on the world war 2 book. This bookhas alot of airplanes in it. And it has a map that shows where it was major battle. the battle was amazing, and the war. AND ALSO THE BOOK IS GREAT! In Lenigrad under siege, a couple pulls a sled bearing a tiny coffin.In Coventry, a priest leads his congregation in prayer, surrounded by the ruins of their cathedral.In the field, a bleeding German soldier is comforted by his comrades, his right arm lying in the foreground.In Kent, schoolchildren watch a dogfight with expressions ranging from horror to delight.In Rotterdam, the city is leveled as far as the eye can see, except for a lone church.In an internment camp in Wyoming, two Japanese-American soldiers, visiting their families, stand honor guard beside the casket of a Japanese-American World War I veteran.Every picture in this remarkable book reminds us that the story of World War II is much more than a collection of battles and troop movements; each reminds us that the war produced a multitude of heartbreaking stories played out all over the world. 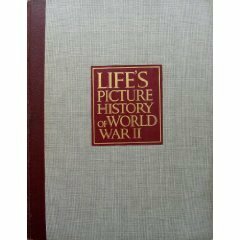 The book surveys the entire war, year by year.Each year is introduced with an essay by a well-known person (e.g., writer John Keegan introduces 1944) and includes photo-biographies of distinguished and infamous people, such as FDR and Churchill, Hitler and Mussolini.Each year also includes a section called "Then/Now," which seeks to relate some aspect of the war (e.g., war criminals) to subsequent history up to present day.A minor criticism of the book is that these attempts to make the war "relevant" seems a bit of an intrusion in the telling of the larger story. A gripping account of the final American bombing mission of World War II and how it prevented a military coup that would have kept Japan in the war. How close did the Japanese come to not surrendering to Allied forces on August 15, 1945? The Last Mission explores this question through two previously neglected strands of late—World War II history, whose very interconnections could have caused a harrowing shift in the course of the postwar world. On the final night of the war, as Emperor Hirohito recorded a message of surrender for the Japanese people, a band of Japanese rebels, commanded by War Minister Anami's elite staff, burst into the palace. They had plotted a massive coup that aimed to destroy the recordings of the Imperial Rescript of surrender and issue false orders forged with the Emperor’s seal commanding the widely dispersed Japanese military to continue the war. If this rebellion had succeeded, the military would have proceeded with large-scale kamikaze attacks on Allied forces, costing huge casualties and just possibly provoking the Americans to drop a third atomic bomb on Japan over Tokyo–and continue to drop more bombs as Japanese resistance stiffened. Meanwhile, in the midst of an “end-of-war” celebration on Guam, Air Force radio operator Jim Smith and his fellow crewmen received urgent orders for a bombing mission over Japan’s sole remaining oil refinery north of Tokyo. As a stream of American B-29B bombers approached Tokyo, Japanese air defenses, fearing the approaching planes signaled the threat of a third atomic bomb, ordered a total blackout in Tokyo and the Imperial Palace, completely disrupting the rebels’ plans. Smith and his fellow crewmembers completed the mission, and a few hours later, the Emperor announced the surrender over Japan’s airwaves, dictating the end of the war. The Last Mission is an insightful piece of speculative investigation that combines narrative storytelling with historical contingency and explores how two seemingly unrelated events could have profoundly changed the course of modern history. For those interested in the war in the Pacific, this is an extremely intriguing book. One of the authors was the radio operator on a B-29; the other has written a number of books on military history. The result is a marvelous combination of low-level details that only someone who fought in the war would know, with descriptions of high-level strategic issues written by a professional historian. This book's importance rests on a major distinction. Germany was defeated by invasion from the east and west. Hitler's refusal to surrender had no impact on the outcome. In contrast, Japan was conquered without invading its home islands. We now know that even after the A bombs were dropped, those in high positions who wanted to fight on whatever the cost were virtually equal in strength to those who wanted to surrender. Only the intervention of the Emperor and his speech to his nation, broadcast at noon on August 15, 1945, brought the war to a quick end. We also know that on the night before that speech, portions of the Japanese military moved into the imperial castle, hoping to destroy that already recorded speech and kidnap the Emperor. Other elements of the Japanese military were planning to launch massive suicide attacks on US carriers operating close to Japan that very day. Those attacks might have destroyed the delicate negotiations to end the war taking place through the Swiss. To give one illustration of why needs first-hand accounts like this, consider one fact that an academic historian might not know. Rather than attempt the difficult task of flying directly to their target over long distances of water, B-29s often aimed south of their target and flew north, parallel to Japanese coast, using the aircraft's radar to establish their position from prominent features on the coastline. They only turned toward Japan when close to their target. That practice, unknown to anyone who wasn't there, meant that Japan's radar defenses could not predict where aircraft they saw offshore would strike. That uncertainty would, in turn, become a critical factor in ending the war early. Others have written "what if" books that suggest that some of history's most important wars might have turned out far differently, if only some small factor were changed. This book does the opposite. It builds on what actually happened and suggests that a specific chain of small events, each unimportant in itself, combined to bring the war to a rapid end. An American pilot was being tortured to reveal something about A bombs. He knows nothing, so to satisfy his captors, he claims that the next A bomb will fall on Tokyo. As a result, Tokyo's air defenses panic when their radar picks up a small squadron of B29s offshore. The planes are headed elsewhere on a special mission, but they don't know that. Fearing another A bomb attack, they shut off all electrical power to Tokyo. That leaves the imperial castle in darkness, making it impossible for the conspirators to find the recording of the Emperor's speech. And that recording was remarkably well-hid, because one person in the Emperor's entourage happened to remember a small safe that a secretary used to keep her jewelry. Each factor in itself meant little. Only in combination did those small factors ensure that the Emperor's speech was broadcast and the war speedily ended. There's much, much more to this book than that, but I hope I've whetted your appetite to read it. It's one of the best war books I've read in years. It's history, but it reads like an excellent novel. Engaging.This is the stuff movies are made of.I hope Steven Spielberg gets a hold of this.I would be more than happy to do the adaptation and take a deferred pay. This book covers an important time in history, with events toward the end of WWII, leading up to Japan's surrender. What makes the book unique is the tie-in of author Jim Smith's bombing missions with the final events of the war, which is interesting in its own right. But of even more interest to me was the coverage of the general events leading to the end of the war.While this material is covered in other sources, and the author includes a number of references, it is material that I was never taught in any high school or college history classes.This material is crucial to, and generally omitted from, the debate about the atomic bombings of Japan. In my college history classes 20 plus years ago, there was a definite tilt in what we were taught, that Japan was ready to surrender, dropping the bombs was unnecessary, and it was a pretty mean-spirited thing to do. This book shows that many in Japan were quite willing to fight on, even despite the atomic bombings.The author does a nice job weaving the tale of his final bomb run over Japan with events on the ground, and how his mission affected these events. There is an earlier version of this story by author Smith, "The Last Mission - An Eye Witness Account by Jim B. Smith:The B29 Raid that Ended WWII. "This is essentially the same story, but told in first person, and including more of a personal perspective.I also enjoyed this book, and would recommend it as well. 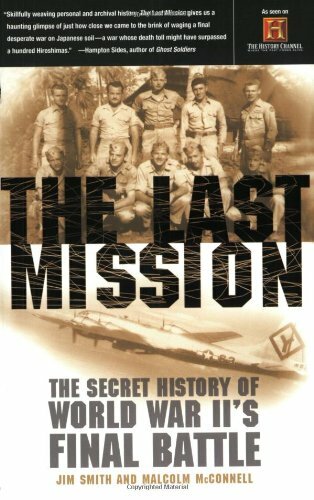 The Last Mission is subtitled "The secret history of World War II's final battle".This subtitle is a little misleading, in my opinion, as the book really focuses on late war (1945) bombing runs over Japan. One of the two authors of the book (Jim Smith) was on a B-29B bomber at the conclusion of the war, including what he calls "The Last Mission", which was a bombing run to attack a strategic oil refinery at Akita, with the routing taking the bombers directly over Tokyo. It is the routing of the bombers that leads Smith and McConnell to write that this mission was the final battle of the war, and perhaps their mission succeeded in ending the war by preventing the attempted coup d'etat from achieving its mission in Tokyo during that final night of August 14-15, 1945.With a full blackout in effect in Tokyo (because of the stream of American bombers passing overhead), the rebels were unable to accomplish their goals of destroying the Emporer's surrender message and convincing the armed forces of Japan to carry on the fight through the final Ketsu-go, or invasion of the Japanese home islands, where the military intended to cause heavy casualties on the Allied forces. There is no doubt that that had the coup succeeded, the war would have continued and Allied casulaties would have been enormous during Operation Olympic (the invastion of the Japanese islands), but I do not believe that this bombing mission single-handedly prevented those casualties).I agree that the timing & routing of the bombers did indeed hamper the rebels' efforts, but I think that the war would still have ended at the same time regardless of whether this mission was conducted or not. I enjoyed the book quite a bit; the personal history interwoven with the known history of the war makes for very interesting reading.The only reason I gave the book just 3 stars is because I disagree with the author's conclusions.I recommend the book for anyone that is seeking to understand the American bombing missions over Japan at the end of the war, but I recommend that each reader carefully draw his or her own conclusions from the text rather than simply accepting that this mission of August 14-15 made as much difference as is suggested in the manuscript. This book provides a detailed examination of the last B-29 bombing mission against the Japanese Empire, as well as a very good description of the atomic bombings of Hiroshima and Nagasaki, and a compelling discussion of the attemped coup by junior Japanese military officers against the Japanese government. By the summer of 1945, the Japanese government was on its knees.Months of stinging defeats coupled by the continuous bombing of the homeland had brought the Japanese to a state of near extinction.Some factions of the Japanese were ready to surrender, citing the mounting losses from the American bombings, but most in the military favored continuing the war while preparing for the inevitable Allied invasion.Japan would strike at the Allies with massed kamikaze attacks while fighting to the last man on the invasion beaches. Meanwhile, the Americans had perfected the world's first atomic bombs.After a successful test in the New Mexico desert, two bombs were shipped to the Marianas for eventual drops on Japan.The first bomb was dropped on Hiroshima, while the second was dropped on Nagasaki.Even after the atomic bombings, Japan refused to surrender.The Japanese were still holding out for the final battle on the Japanese mainland.However, Hirohito and members of his cabinet were discussing the acceptance of the Potsdam Decleration, the Allied message to Japan stating the Allies would only accept unconditional surrender from the Japanese.This caused the Japanese great concern, for they wanted the freedom to disarm their own troops, prosecute their own war criminals, maintain the emperor, and have no Allied occupation.All of these terms were considered unallowable by the Allies. At the same time, Russia had entered the war against the Japanese, and they were sweeping through Manchuria with their sights set on Northern Japan and a chance at being allowed as part of the post-war occupation force.The Allies wanted to avoid this possibility. After a moratorium on bombing raids over Japan, the raids began again.Since most important targets had been destroyed, the target selected was the Akita Oil Company refinery in Northern Japan.Was this a coincedence, or did the Americans specifically select this target so it wouldn't fall to the Russians in the event they advanced into Northern Japan? Radar picked up the B-29s as they were heading North, and a total blackout of Tokyo was ordered.It was feared by the Japanese that the Allies were prepared to drop a third atomic bomb on Tokyo, thus the city was blacked out.It just so happened that the blackout occurred precisely when the scheduled coup was supposed to start.The main objective was to find the wax disks that Hirohito had used to make his surrender recording on.The militants wanted to destroy these disks and make their own broadcast stating the continuance of the war.However, due to the blackout, the militants had a very difficult time finding their way around the Imperial Palace, and the coup failed.Hirohito's broadcast went on as planned.Is it possible that this one final mission indirectly lead to the failure of the coup due to the blackout order?There is compelling evidence in this book to support this argument. My father served in the European Theater during WW-II. He arrived in France a month after D-day,thus missed the "big bang" of the Invasion.But his experiences fighting on the front lines pushing into Germany with going over the top and witnessing the major depression that the German people were going through due to their willingness to surrender simply they were done fighting for by a dream by their mad dictator to create the perfect society.In 1950, when he was in his senior year of college, LIFE issued this large volume of the History of WW-II and he bought a copy simply that he can relate to it since he was there.When I was in grade school, I found this book in his book collection and begin to read it and studying all of the information and witnessing the pictures that the photographers for LIFE have taken. This volume is a well-worth collection to any world history buff and teacher out there.Recommended! I acquired this book as a young man after my grandfather's passing in the early 1970s and have held on tight to it ever since.Not only is it an excellent collection of pictorial and text information about the war; it is a time capsule of how the people of the WWII era viewed their accomplishment.In it, there is no attempt to apologize for Hiroshima or Dresden; there is no mention of the Japanese-American internment; and our former Pacific enemies were still called "Japs".If you want to understand the mindset of those for whom this war was only just barely history, this is a fabulous collection. The immediacy and perceived truth of the visual image, as well as film and television's ability to propel viewers back into the past, place the historic film genre in a unique category. 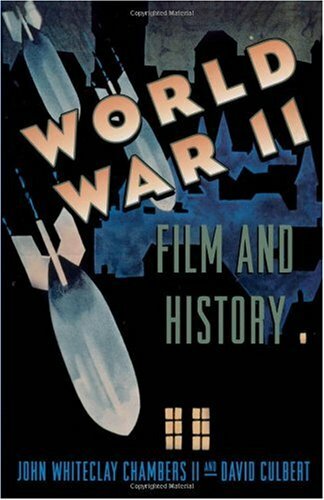 War films--including antiwar films--have established the prevailing public image of war in the twentieth century. For American audiences, the dominant image of trench warfare in World War I has been provided by feature films such as All Quiet on the Western Front and Paths of Glory. The image of combat in the Second World War has been shaped by films like Sands of Iwo Jima and The Longest Day. And despite claims for the alleged impact of widespread television coverage of the Vietnam War, it is actually films such as Apocalypse Now and Platoon which have provided the most powerful images of what is seen as the "reality" of that much disputed conflict. Exploring the relationship between moving images and the society and culture in which they were produced and received, World War II, Film, and History addresses the power these images have had in determining our perception and memories of war. Examining how the public memory of war in the twentieth century has often been created more by a manufactured past than a remembered one, a leading group of historians discusses films dating from the early 1930s through the early 1990s, created by filmmakers the world over, from the United States and Germany to Japan and the former Soviet Union. For example, Freda Freiberg explains how the inter-racial melodramatic Japanese feature film China Nights, in which a manly and protective Japanese naval officer falls in love with a beautiful young Chinese street waif and molds her into a cultured, submissive wife, proved enormously popular with wartime Japanese and helped justify the invasion of China in the minds of many Japanese viewers. Peter Paret assesses the historical accuracy of Kolberg as a depiction of an unsuccessful siege of that German city by a French Army in 1807, and explores how the film, released by Hitler's regime in January 1945, explicitly called for civilian sacrifice and last-ditch resistance. Stephen Ambrose contrasts what we know about the historical reality of the Allied D-Day landings in Normandy on June 6, 1944, with the 1962 release of The Longest Day, in which the major climactic moment in the film never happened at Normandy. Alice Kessler-Harris examines The Life and Times of Rosie the Riveter, a 1982 film documentary about women defense workers on the American home front in World War II, emphasizing the degree to which the documentary's engaging main characters and its message of the need for fair and equal treatment for women resonates with many contemporary viewers. And Clement Alexander Price contrasts Men of Bronze, William Miles's fine documentary about black American soldiers who fought in France in World War I, with Liberators, the controversial documentary by Miles and Nina Rosenblum which incorrectly claimed that African-American troops liberated Holocaust survivors at Dachau in World War II. Weatherford starts well but then throws out the pattern from the first chapter and gets worse by the mouthful. She uses a great deal of personal diary entries in the book which general depict a woman's frustration with her role or world and then Weatherford puts herself in the woman's shoes. For almost every "fact" that she delivers, she then adds her own take on the facts and the woman's position. Weatherford pretty soon becomes one of the diarist's angry entries page after page. For example, she repeatedly uses very petulant phrases like "once again," "finally," "sadly," "unfortunately" and the like to beat the dead horse. She also summarizes situations by making apocalyptic judgments on her data or topic, such as (p. 187) "the government ultimately could have saved itself billions of dollars in welfare costs if it had undertaken then to see that women's wages were raised to a reasonable level" and (p. 272) "Like millions of bright women before and after the war who were forced by their husbands' careers into military and college towns too small for their abilities. 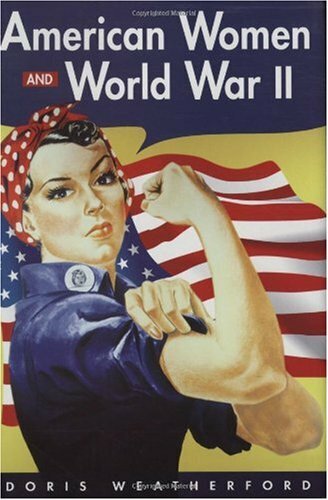 . ." Almost every woman described in this book gave 110% for thankless endeavors, got a crust of bread at day's end, walked two miles thru snow daily to reach her job, managed every chore under the sun without complaint, and then went to bed feeling tired but proud that she helped the war effort. Almost every man described in this book is a thoughtless bureaucrat unable to match a woman to a perfect role or place, a faithless husband or GI, a chauvinist -- an idiot in short. ONCE AGAIN, Weatherford editorializes every point and exaggerates every conclusion. The book has some merits and opened my eyes to a few things, but by and large this is hardly an objective account, but rather a tiresome tirade on the old theme of how perfect the world would be if women ruled and men silently followed orders. I think this book was as well written as American-Made: The Enduring Legacy of the WPA: When FDR Put the Nation to Work by Nick Taylor. That says a mouthfull. Real page turner. This product was shipped to me very quickly, and as promised from the seller it was in very good shape for being such an old soft cover book. I recomend the Ballentine series of hitory books to any interested in this part of our heratage as a country, they are well written, with a wealth of photographs and maps. 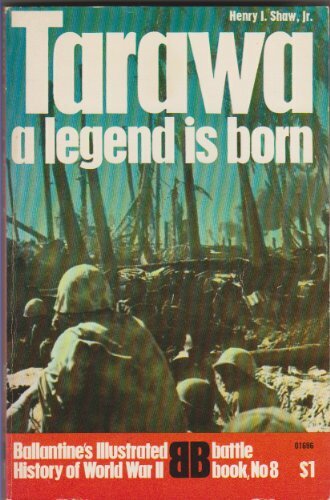 This book uses the concise Ballantine's combination of readable prose and graphic photo's to describe the brutal battle for Tarawa in 1943.As the author shows, the Japanese had fortified the island, and the assaulting U.S. Marines suffered heavy casualties on the beaches from defensive preparations and errors in planning and execution.Readers see that the U.S. soon prevailed, but at a cost of heavy caualties for both sides.We also see how later U.S. island-hopping used better planning, while Japanese defenders often retreated inland to avoid the heavy bombardment of the beaches.I'd have liked a bit more information on landing craft, but the book takes an effective look at a brutal battle. I read this good book, translated to the portuguese, here in Brazil.This book is very short, concise and easy to understand.This book also has many photos and a few maps;all of them black and white.The last chapter is about the consequences of this battle. The failures of this good book are small.About the military equipament, mainly the anphibious vehicles, this book is a little weak.